The emerging star defeated world number two Travis Grant, Jake Jensen, defending champ Beau O’Brian and a who’s who of the Aussie paddling scene. To cap it off, Nottage also narrowly beat home the top unlimited guys, giving him the 14′ and line honours double. Today’s victory comes just a week after the 18-year-old claimed his first big win at The Doctor, where he defeated a similar lineup of talent. It proves that Nottage is going will be a force to be reckoned with next year, while it’ll also boost him even further up the SUP Racer World Rankings. 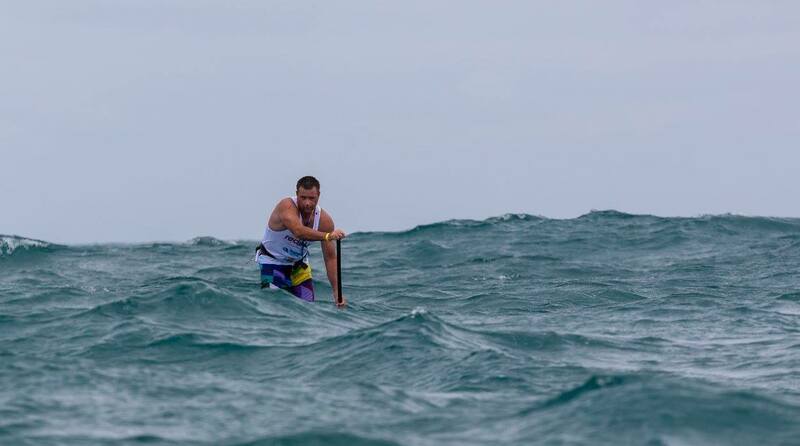 Travis Grant, long considered Australia’s best ocean paddler, settles for the runner-up position for the second week in a row. The margin was a little wider this week though, with Trav over 2 minutes behind Nottage at the end of the 24km downwind course. The unlimited boys, Dave Kissane and Marcus Tardrew, were near the front the whole way and almost scored their line honours goal, but young Nottage was just too good for everyone today. Michael Booth also had a good day out on the water, coming home 5th in the main 14′ division just one second behind Beau. In the women’s it was Angie Jackson going back-to-back, coming home nearly five minutes clear of runner-up Terrene Black. Angie almost didn’t race, overcoming a virus to take her spot on the line. Sounds like conditions were firing and everyone had a great run, which bodes well for the future of this event. The King of the Cut has arguably become Australia’s premiere SUP race, and hopefully it only continues to grow in stature.